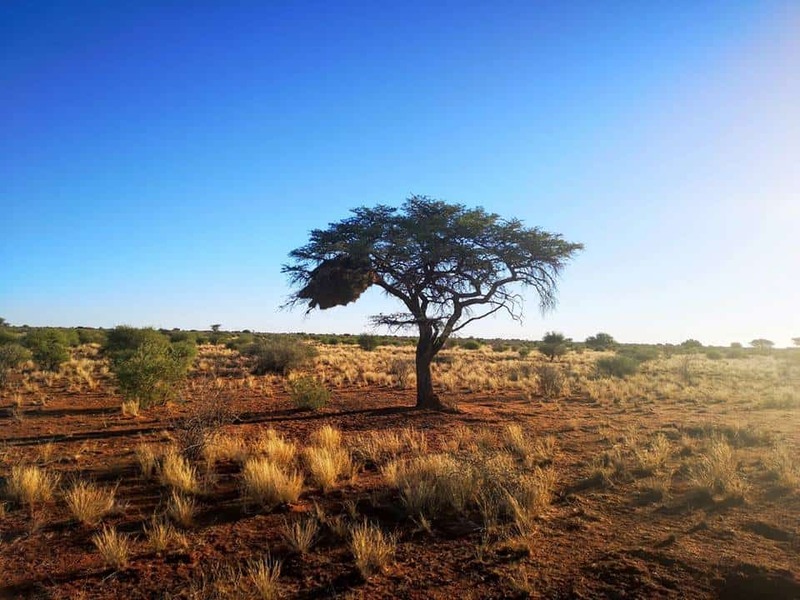 Namibia ,…a soaring world/paradise in his own, an unforgettable experience for young and old. —–You can get used to it !!! Even when they say that it’s not the real Namibian weather, though I think the last couple of days were too good to listen to such a statement, we do have to look more and more at Namibia as THE PLACE TO BE for 1000 km.-plus flights, You can fly them at many more places, but not nearly every day. It’s also nice to see that more and more pilots choose good double -seaters to fly those long distances!!! AND,…As Namibia is the place to be for REAL long distance flying and doing it together/ sharing the fun , is nicer than alone, you can start counting 2 seaters on the OLC nowadays, where they were not even on this list in the past. So many 2 seaters and so many SUPER flights. Look at the OLC on last Wednesday;29 over 1000 kilometer-flights most in a 2-seater. And on December 17 you saw 21 ARCUS M, VERY POPULAR, and 1 ARCUS T up in the air on page 1 from the OLC. On top of that there were some EB versions and the ASG 32 MI and a 20 m. DG 1000.Also the Nimbus 4DM flies happily around. There are friends , like Hans and Alfred Paul from Holland flying the Nimbus 4DM over 1.103 km.with 125 km./h on the clock from Douglas. 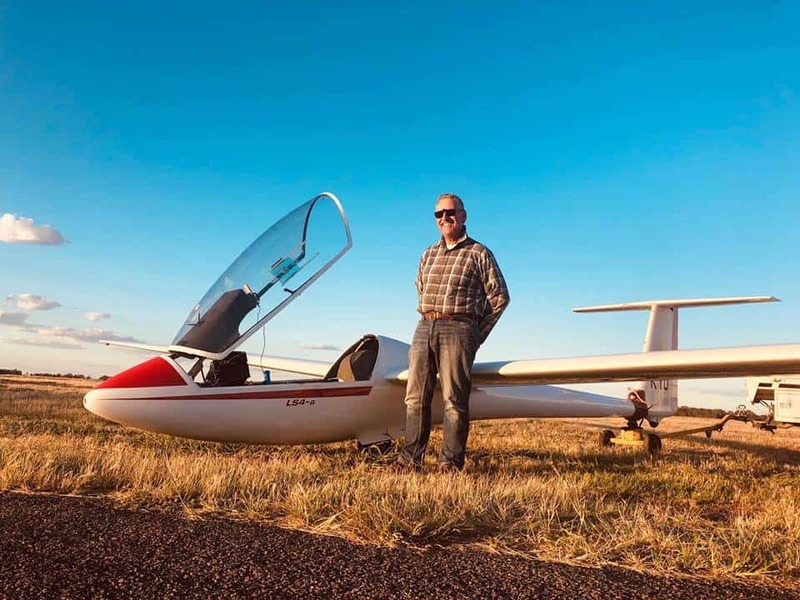 Father and son from Australia , Michael and Matthew fly with “verve” The ARCUS M from Kiripotib with 1.021 km and 145 km./h. They did as the wrote, some “sightseeing in Botswana”.What do you want more??? Michael shared these pictures from it’s not all hosanna! 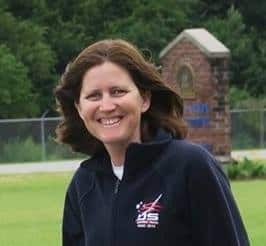 “I catch a lot of flak for flying OLC and not declared tasks – personally I find deciding where to fly while inflight infinitely more fun, but each to their own. But today, I saw an interesting forecast on SkySight, a convergence to the south east, convergence to the south west, so I declared a 1000K FAI around it and had a go. 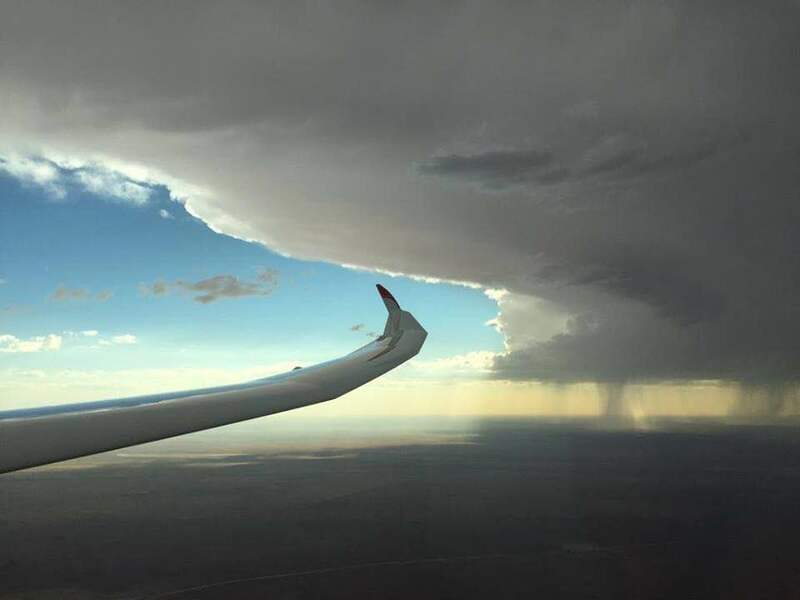 It actually worked out even better than expected as there was a gust front along the last leg. The last 10k was a bit interesting having to glide directly into the dust and then rain and heavy sink, but we still arrived a thousand metres high. 1000.3km FAI in 6.5 hours for 152kph, which we will claim as an Australian overseas record. Tomorrow though, back to good old OLC. Off course Matthew was thrown in the pool. Danish mates ,as well as many German and a few French and Austrian mates, they all enjoy their long distances in comfortable gliders. Of course some prefer to fly alone certainly when they have a good EB 29 and then top the OLC list as Alexander [Meuller] with 1.190 km. with 137 km./h. A great kilometer-eater flying from Pokweni. If that was not enough Alexander flew on Thursday 1.312.89 km. with a speed of 169,98 km./h. Even with all those flights in the pocket this still must gave him a boost !!! Keith [Essex] added another 1.356 km. in the EB 29 D.
With all these TOP GLIDERS and the top weather, the 1.300 is nearly “the new normal”. Good to see Gerd Marzinzik, who I know from the past, is still flying; a 1000 in an ASH 26E from Bitterwasser. Good on him !!! No miracle the boy’s from Flying with the Champions/Rent a glider ordered 2 new Arcus M. gliders for their operation. By the way ,…the 1000 k remains magic for many, as I found out AND of course IT IS, certainly the first one!!! !I still get excited because from the past I can still feel the tension and the waiting specially those last kilometers were nail biting.Though gliders and instruments and weather forecast were then much less than now.That’s a fact. Also the Scutter’s flew that day and added their 5th over 1000 km. flight to the logbook. So to read ,dad Michael ,is very impressed with his son’s soaring. Nice!! Of course he is good, he was the Narromine Junior World Champion. The 65 th Argentinian Nationals went on on paper as flying over the last day’s was not possible anymore . Looking at pictures with muddy boots from kids it must have rained!!! 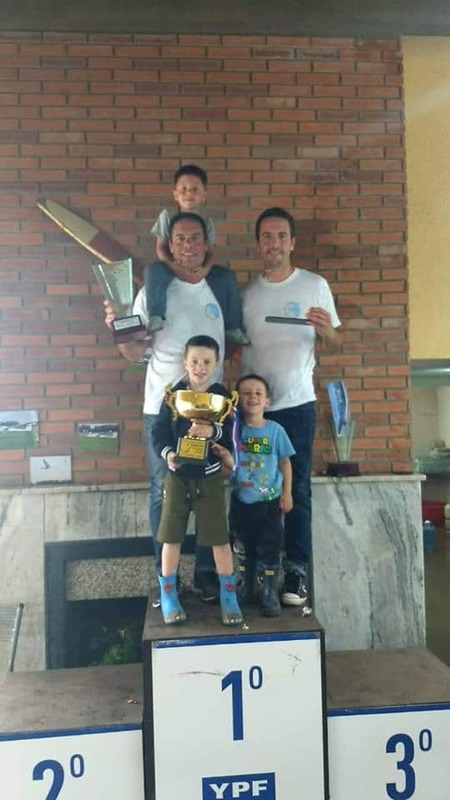 From 12 day’s they flew 7 in the combined 15 m/open and Damien Goldenzweig [18m.Ventus 2 CM] won the title with 5.533 points. Runner up Santiago Berca with 5.490 in the same glider. Only 6 out of 12 day’s in the combined standard class and here it was Lucas Goldenzweig who won the title. [4.878] He won in the LS 4 and the next 3 gliders on the overall scores were LS 4 as well. The Goldenzweig brothers , Damian and Lucas, both on spot 1 and few little ones ready to take over in the future. ——The 2018 Victorian State Comps at Benalla had mixed weather, good but they suffered also from rain . In Tocumwal I heard even 50 to 60 mm on a day with only 18 dgr. C. and that’s only 70 km. N of Benalla. There were two class groups – Un-Ballasted from which the Club Class championship will be determined and Ballasted, from which the FAI class championships will be determined. 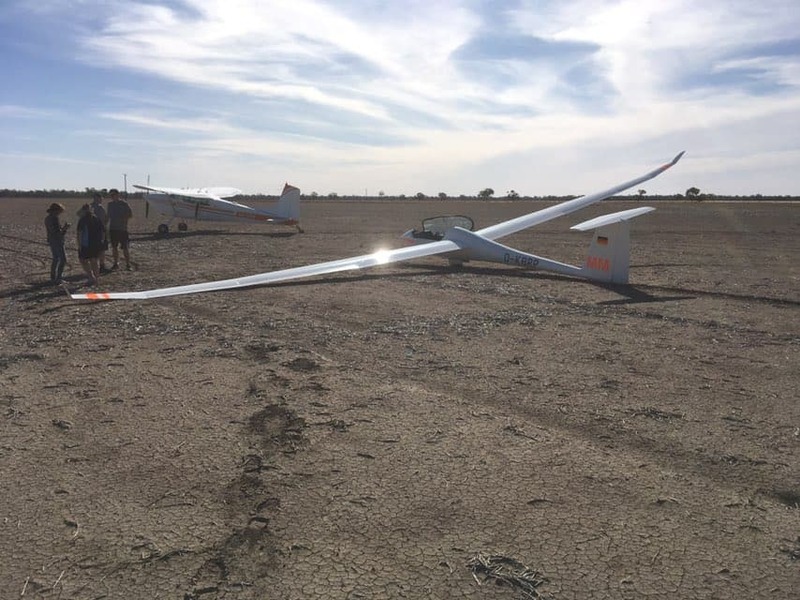 4 Day’s out of 7 for the “ballasted” gliders  ,with 421k. as the longest task and 2x a 3 hour AAT with 417 as best result by Lumpy Paterson in his JS 3 ; nice speed too 138.87 km./h. But on handicap that made him 5th for the day. After 4 day’s the winner was Bruce Cowan with 3.511 points in a Ventus B/15 m.. In the “unballasted” class Craig Collins from Mount Beauty was the star winning/shining every day in his ASW 20 .He won after 4 day’s with 3700 points!!! Good on him. Straight after the comps the weather was booming again!! By the way the next multi class Nationals will be in Tocumwal. Love that. We always wanted to have the Nationals there but it was our peak-time with everybody in full action and all gliders booked. We just lacked time and space in high season. Lumpy Paterson is the great “engine” behind this. He bought and runs “our” old WW2 hangar now and he really puts an effort in the place now after a few years of mismanagement by the sole last owner, who took over after us .The hangar was nearly lost. Dear friends, through my blogging I keep going, which means it keeps me fit, it gives me a boost!!! Though the flu last week was a an unexpected nuisance and still is. 72 now still going pretty strong. THANKS for the many good wishes for my birthday on FB, personal mail and phone. Good friends even called me from Namibia!!! AND,….NONE of my Aussie girl-friends forgot me!!!! Thanks for reading with [still] so many; I do not write for nothing. Time to say THANK YOU and to wish you during this upcoming festive season, the very best Christmas time with your family and friends. MERRY CHRISTMAS…ZALIG KERSTFEEST…FROHE WEIHNACHTEN….FELIZ NAVIDAD….JOYEUX NOEL…GOD JUL….HYVAA JOULUA…BUON NATALE….Merīkurisumasu…. Narromine…great comps!65th Argentinian Nationals in combined Standard and 15 m./open class. Continued;…The 57 th Narromine Multi class Nationals … 2 day’s to go!!!! Preparations for the last but one day. With 2 day’s to go everybody, who was still in the race to win, was in “alert mode”. AND,….pretty big tasks on the last but one day, which is good. So 1000 and 955 points. Peter and his wife Lisa both fly on high level and are lovely people. Lisa by the way was 4th for the day in 15 m. but runner up in her St. Class. I have not yet seen the pilots-list for Lake Keepit, but I am sure Lisa will be on it. With 6 x an LS 8 in the 15 m. top ten ,they did well!!! The top 3 with 1 day to go in 15 m.; 1. Adam 6. 282…2. Tobias 6.014….3. Andrew Maddocks 5.465. The top 3 with 1 day to go in St. class; 1. Andrew 5.848… 2. Peter 5.823…3.Allan 5.727. Another daily win for Norm and nice speed again; 137 km./h. Tom was runner up and still on spot 1 overall in his ASG 29. Geoff Brown in his JS 1 [18m] is doing a great job and was third and also on spot 3 overall with one day to go. open;1. Tom 6.343…2. Norm 6.039…. 3.Geoff 5.970. 18m; 1. Tom 6.342…2. Norm 6.044…3 Geoff 5.971. December 7 day 11 task 8; FINAL DAY from a very good competition. 343 km. for Tobias and he deserved another “win” , [3d] speed 114 km./h. 5 Points less for Allen and 11 for “Woolley-pup”. 1. Adam Woolley with 7.268 points. 2. Tobias Geiger with 7.011 points. 3. Peter Trotter with 6.362 points. In standard class a “bad day for Andrew. He was number 1 overall, did not fly too bad with a 6th daily prize, but lost more than 200 points. And with points SO close,[ see above], that cost him the title.He dropped from 1 to 3. A pity. 1. Peter Trotter with 6.743 p.
2. Allan Barnes with 6.727 p.
3. Andrew Maddocks with 6.634 p.
Lisa and Claire did very well on a 5th and 6th spot. Also Kerrie on spot 14 did well and Jenny on spot 12. Catherine on spot 22 and Akemie won a day before she had to return to work. 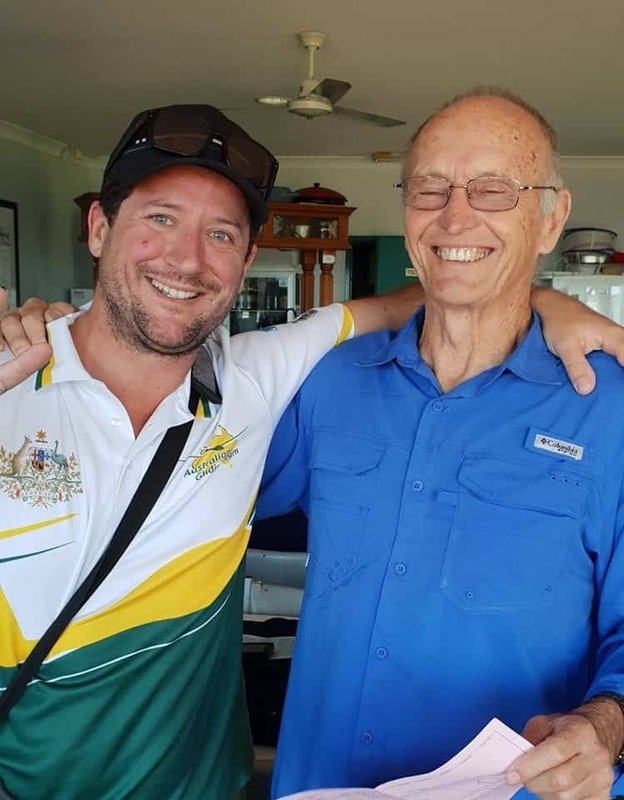 GOOD girls….Let the WWGC begin…..
Geoff was in the end in a really good flow, he really got the “hang” of flying in Narromine. He usually flies from Canberra. He won the last day and flew 373 km. in time 3.03.57. Good day for Scott in his ASH 25; a runner up spot with Norm as number 3 for the day. 1. Tom Claffey with 7.224 p.
2. Norm Bloch with 7.007 p.
3. Geoff Brown with 6.970 p.
18 m. class top was the same. Packing-up- time after great comps. And for some …..LONG ,long very long trips home. 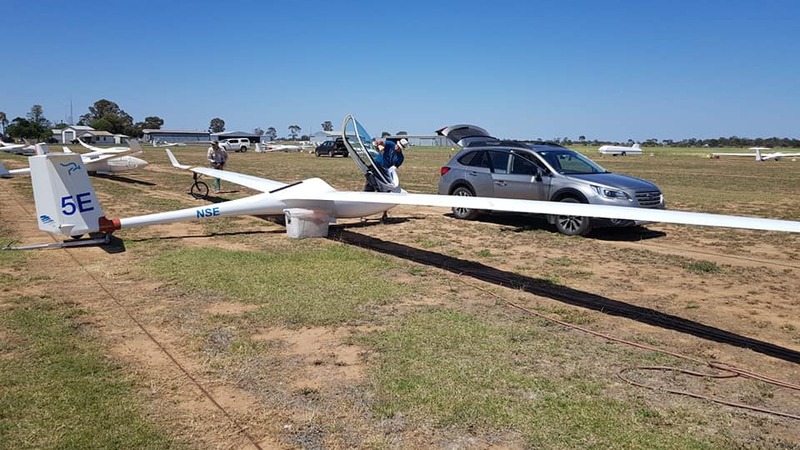 Some straight away traveled to Benalla for the Victorian State comps [December 9-15] and luckily the first day was cancelled so pilots as Lumpy and Terry , who fly in the ballasted class  could straight away fly the set 421 km and the 3 hour AAT a day later,both won by Lumpy in the JS 3. In the unballasted class a 329 was set and a 3.30 AAT yesterday and Craig Collins in the ASW 20 won both day’s. 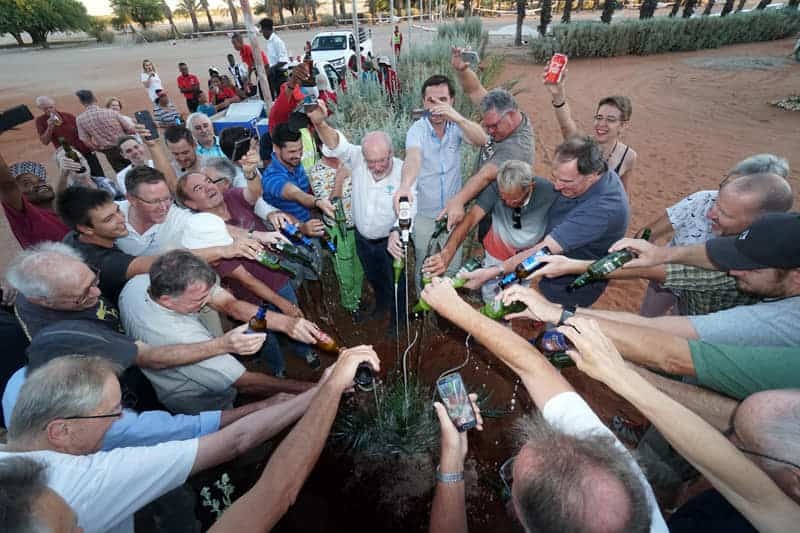 On the other site of the world the 65th Argentinian Nationals started in 2 classes on December 3 continuing till December 14. San Francisco was the place to be. 51 Pilots flew in a combined Standard class and combined 15m./open. The first 4 day’s showed 3 flyable days in st and 4 in 15m./open. The 3 hour AAT task in both classes was interesting. 2 Silent 2’s won that day with 309 km. 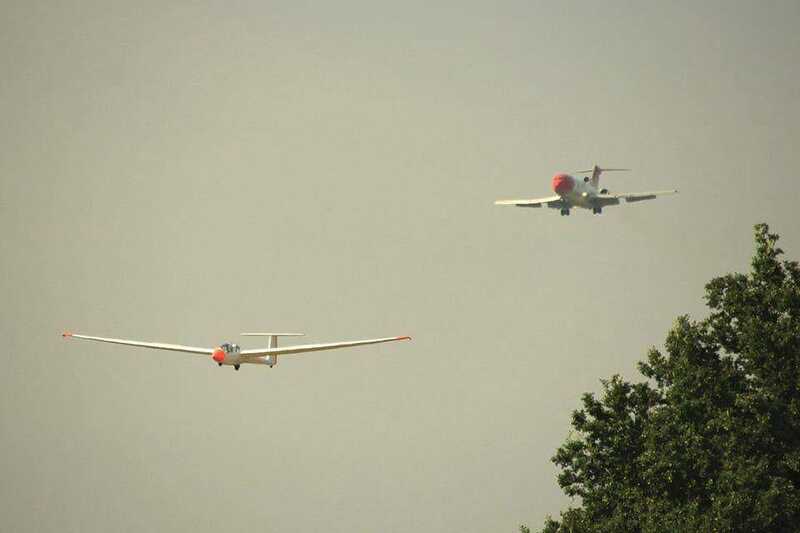 followed by 4 LS 4’s one flown by Lucas Goldenzweig. 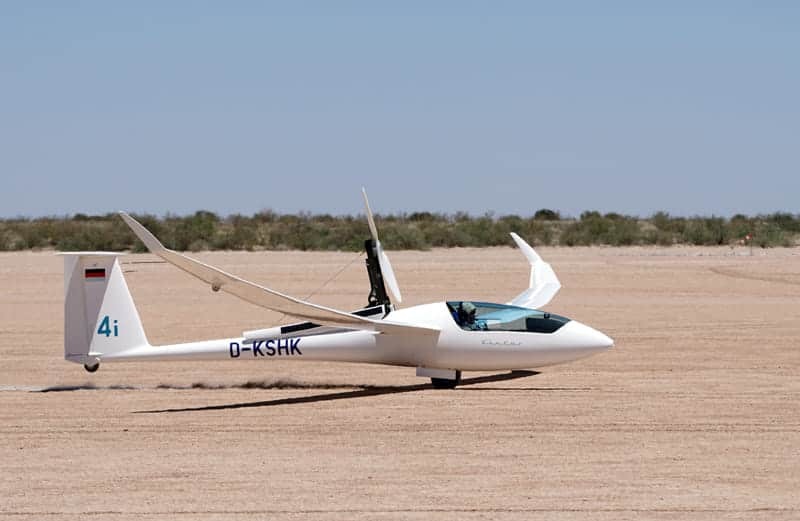 In the other class the 15 m- Ventus B flown by Jose Dentone was the best on handicap with 353 km in time 3.05 whilst Damian Goldenzweig in the Ventus 2CM/18m. was equal in time but he flew 378 km with a speed of 122 km./h. After 3 day’s Lucas leads in St. class and Jose in 15m./open with 45 points on Damian. The next 4 day’s had in both classes a cancelled day. In 15 m/open AAT’s around 2 hours and 1 from 3 hours; 286 km in time 3.03 for Sebastián Riera. Damian was 7th that day and Jose 16th both loosing some points. After 8 day’s and 7 task’s another overall update; 1. Damian…4,574 points, 2. Santiago Berca [ both in Ventus 2CM/18m. ]with 40 points less. In st class after 8 day’s and 6 tasks’;1. Lucas with 3,896 points and 2. Cristian Franzini [ both in LS 4] with 55 points less. 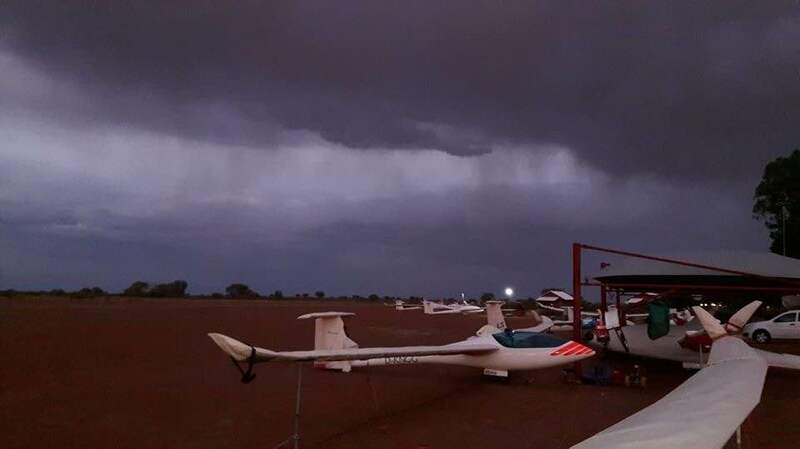 —–December 6; Peter Temple is not flying the Nationals in Narromine , but I do have to mention him as he flew from Gawler a 1000 k in his ASG 29 in mostly blue conditions!! !Good on him. He topped the OLC that day before 1000 km.-flights from Kiripotib, Douglas and Veronica , they have already so many!!! 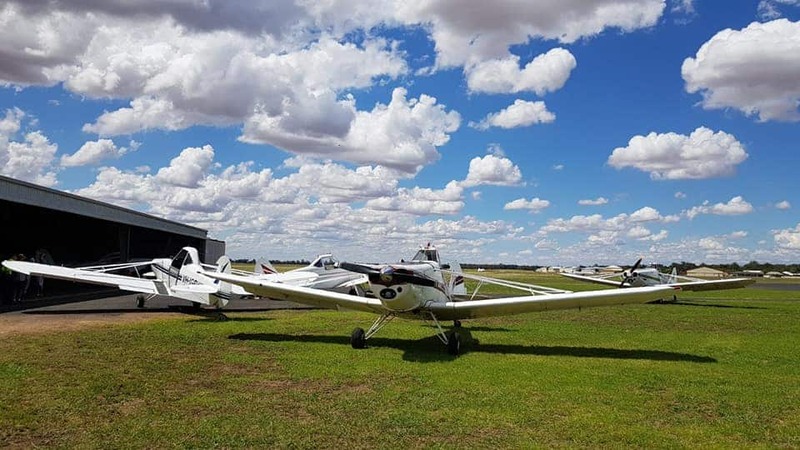 Same day great weather in Tocumwal and Corowa as well, with 806 in the ARCUS M by Joergen from Denmark and 838 by Chris Davison in the 21 m JS 1CTJ. Terry Ryan, usually flying from Tocumwal, flies nowadays from Corowa and flew 760 in his ASH 26E. —-December 8; Dutch pilots are having a great time with several 1000 km flights from Douglas. Hadriaan flew 2, even one 1.100 km.with 135 km./h. in the JS 1 BTJ. And Rob and Max had 4 m climb at 6.20 PM. in the Nimbus 4DM. ——That we had a fabulous summer here in Holland, is pretty clear after all the records we broke, but it also interesting to see that more pilots went out flying! !For the first time in history Dutch pilots, 651, flew in Holland over 1 million kilometers in one season!! !Steven Raimond is our 2018 champion . And to finish a great picture from Namibia. There they have a great season, but the “connoisseurs” think it was till now not a real classic Namibian weather. That special honor is MORE THAN DESERVED. One of the 3 lucky young pilots is from Holland Luc Stalman [ due to his age his last season] .Luc normally flies at Venlo. Nice young fellow, who was allowed this season to fly the brand new Ventus 3M. The new VENTUS 3 M.
Got the flu,even with my anti-flu-injection, so not too much to read, hopefully next time more. Off to the doctor now. 57th Multi Nationals in Australia ….as said, good,better,best and fast! 57th Multi Class Nationals in Narromine. 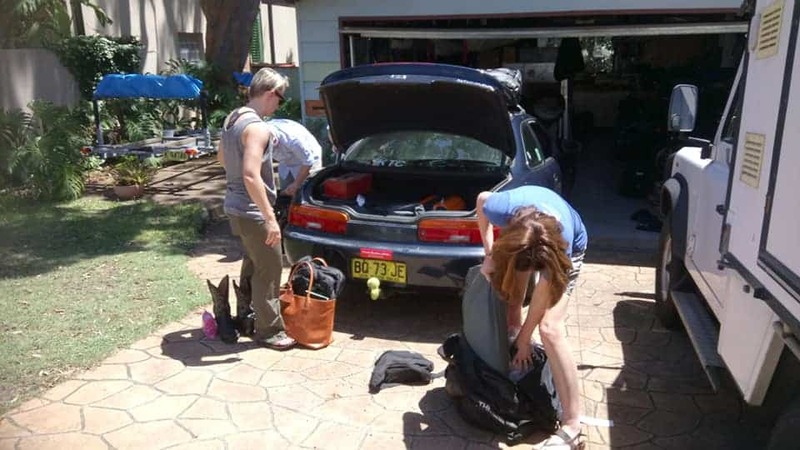 That evening I saw heavy flooding of parts from Sydney on TV. So after the wet days its better not to out-land for the pilots without an “engine”, to avoid extra problems. But as expected the front left and the nice weather arrived!! Look at this . Pawnees ready to go…..for flying day 1. November 29, day 3 task 1: good tasks, good flights only one out-lander who returned by areo-tow retrieve. So a good first day of flying. 15 m; 313 km….Adam[Woolley] won task 1 in his Ventus 2A, only just,… as Tobias [Geiger] had about the same time though he started nearly an hour earlier also in a Ventus 2A. Speed 112.98 for 112.11km./h. St. class; 313 km…nearly all the same but a different winner Andrew [ Maddocks] in an LS 8 with a speed of 104,47 km./h. 5 LS 8 gliders in the top 5, with Peter [Trotter] as runner up. Open/18 m;362.76 km. for both classes. 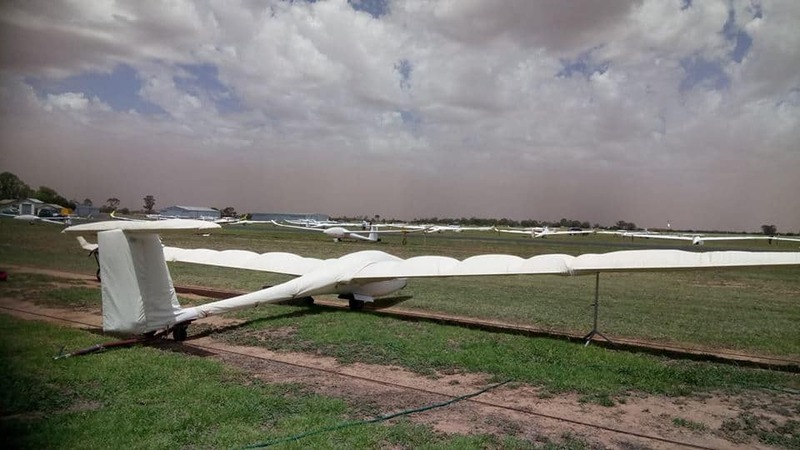 There are at this stage 3 JS 3 gliders in Australia and they flew in this class. Butch [John Buchanan] won with a speed of 134.91 km./h. Lumpy [Paterson] was 4th and Norm [Bloch] ,both in JS 3, was 5th. Runner up was Tom [Claffey] in ASG 29 and Brad [Edwards] in the same glider was 3d. George was 7th in the Discus 2 CT.
All started with in 15 minutes. Butch flew 2 hours 41 minutes. Number 19 for the day 4 hours and 36 minutes,…but he was IN!!!! November 30 day 4 task 2; 516 and 647 km. 516 and 647 to go…..
last day of our meteorological winter and last day of autumn in Australia. AND as said after rain-front , the new cycle starts and it gets good better, best!! !Great tasks!!! 15m./ St.class; 516 km. …..They fly in one handicapped class with the same tasks but different winners. In 15 m. Adam wins again [126.07 km./h] and Tobias [124.47 km./h.] is runner up again. ;1000 and 978 points for the toppers. Great to see that Akemi from Japan, but spending lot’s of flying time in Australia , won in st class in her LS 8. Good on her.AND ,..a 1000 points day so those were her’s. Speed 116.97 km./h. A pity she had to go to work later. 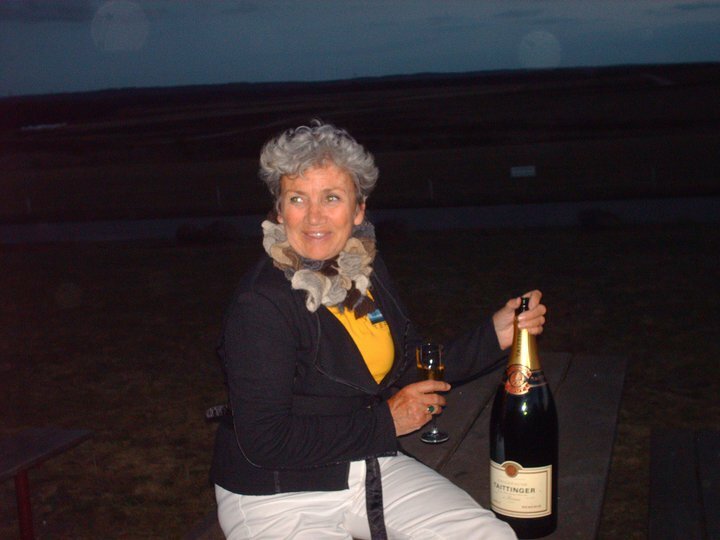 18m./open: 647 km….. WOW,….4 JS 3 gliders in the top 4 and then 2 JS 1’s!!!! Butch won again with a speed of 126.57 km./h. [ 5 hours and 7 minutes] ,just a tad faster than Brad [126.39 km./h.] who got 998 points. Lumpy had a speed of 125. 43 km./h and Norm 125.27 km./h. 4 Outlandings in 18 m. and 3 more in open. Looking at the 18m. scores it was about the same. George, who since at least 30 years had not flown long distances, was 15th. Good on him.This is his first real competition again since years. He flies the Discus 2CT with an handicap of 1030,whilst JS3 has 1085. In his “young” years he flew several WGC’s and EGC’s and he won Australian Nationals in Leeton. Both winning 2 day’s in a row and good mates as well. Adam and Butch. Another good day done and dusted!! 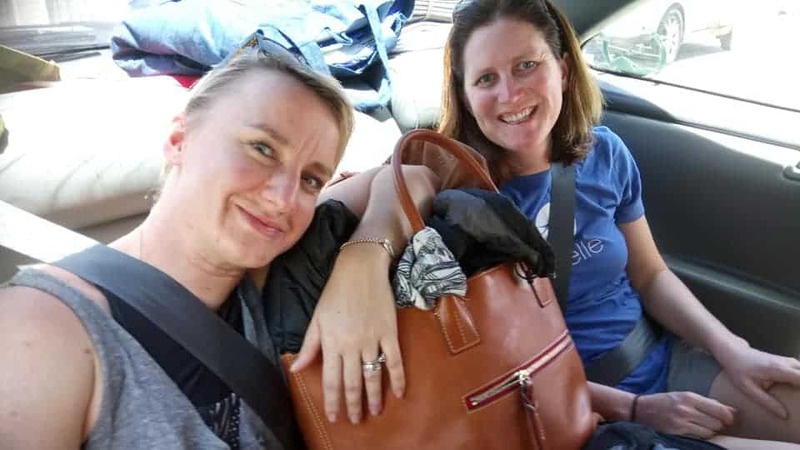 December 1 …SUMMER….day 5 task 3!!! Summer started with a 3 hour AAT for all classes. 15 m and standard class. Adam mentioned in his comment that it mainly all went his way, which means another daily prize.He even did very well, he flew 338k. in 2.59 and Tobias 349k. in 3.18. In open/18 m. same task but more kilometers; Tom [Claffey] won the day 373 km in 3.02. 3 From 26 outlanded. After winning 2 day’s, Butch nearly lost 200 points after being 7th for the day. After 3 tasks the scores are pretty close; Tom is on 1. with 2.826 p. ….Lumpy on 2. with 2.709p…and Butch on 3. with 2.703 p.
December 2 day 6 and an official rest day. 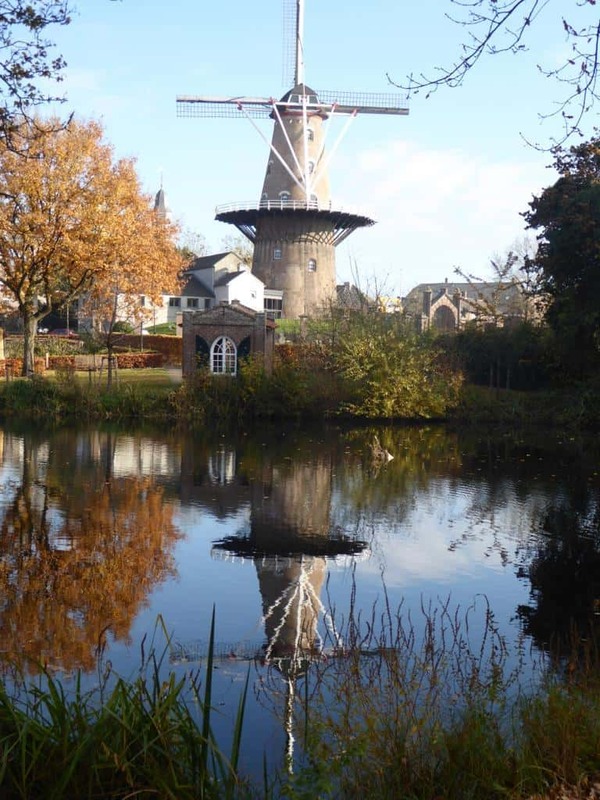 On a day we here in Holland, had up to 15 dgr. C, the hottest ever 2d of December in history.It’s WINTER!!!! 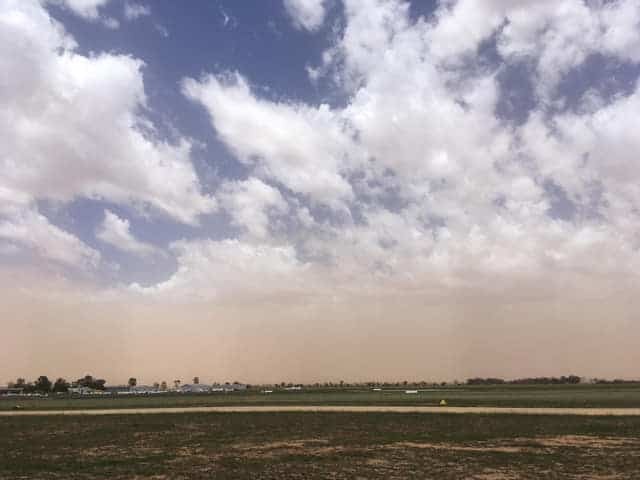 So not the very best weather, in Narromine, dust and up to 60 km./h. wind, so after some long flights over the last 3 day’s a rest day was called. Dust storm as seen by William and Tom as winner as seen by Tom and Kerry. “Quote of the day from the Open/18 winner in a 29 (ahead of the JS3 Mafia) …. “I’m wearing my JS hat given to me by Jonkers – all I can say about JS is ‘they make nice hats’“. A rest day during the Aussie Nationals means a PILOTS MEETING. As pilots live all far away from each other , sometimes more than 3000 km., this is the best chance to talk about all important things in gliding. I have been at several, very interesting though,… sometimes in the far past some pilots went on and on , on an item, and then you could hear some grumble from the rest. Challenging day even for Adam ,…but no worries he won again. All those hours he flew in Australia and wherever he could overseas, over the last couple of years, did” bring grist to his mill.” Good on him!!! 268 km. in time 2.35, whilst runner up and well known “kilometer-eater” and also WGC participant , Allan [Barnes] flew 250 km. in time 2.34. In standard Allan was the best in his LS 8. Claire [Scutter] Matthew’s sister was runner up ,good on her. “Blowing a gale, 15-20kts all day. Tough going, certainly a day you wanted to stay reasonably high. My game plan was to take anything above 3kts, amazingly with the supreme feel of the V2a, I was able to keep taking 5-6’s all the way to the end of the 3rd leg. Luckily at the downwind leg I was at my lowest, but couldn’t for the life of me get the climb I needed to come home on. Something was on my mind & I tensed up, couldn’t feel the climbs & really had to push myself to trust my feel of where to go next. I lost time here, but managed to bring it home, phew. Bad day for Bryan,…he was out. open /18 m.; 2.30 AAT. Another win for Tom; 283 km. in 2.39. Lumpy was runner up with 308 km. but he needed a bit more time;2.53. Both lead the way in these classes, with Butch on their heels. Bad day for George, as he had to out land after 146 km. 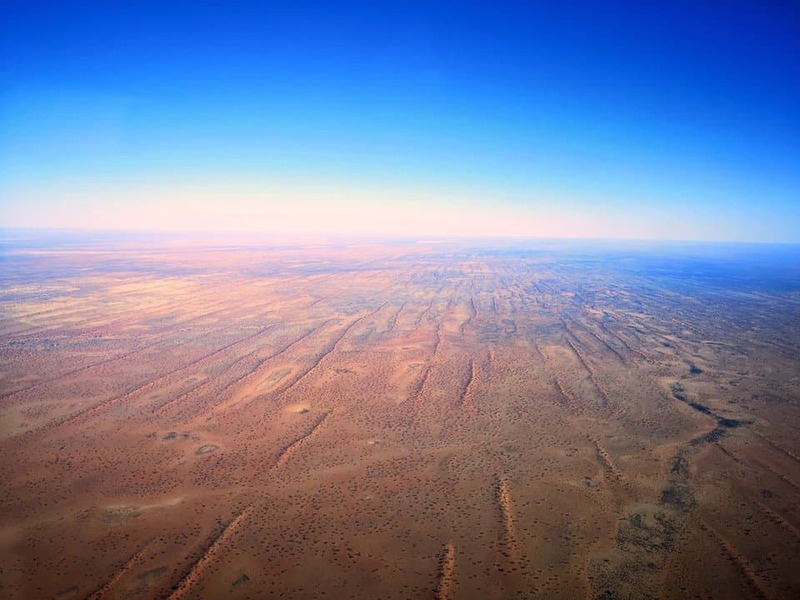 “Dry as a bone ” the land in Australia a bad drought this year!! There is a nice story with this Cessna from Arny. 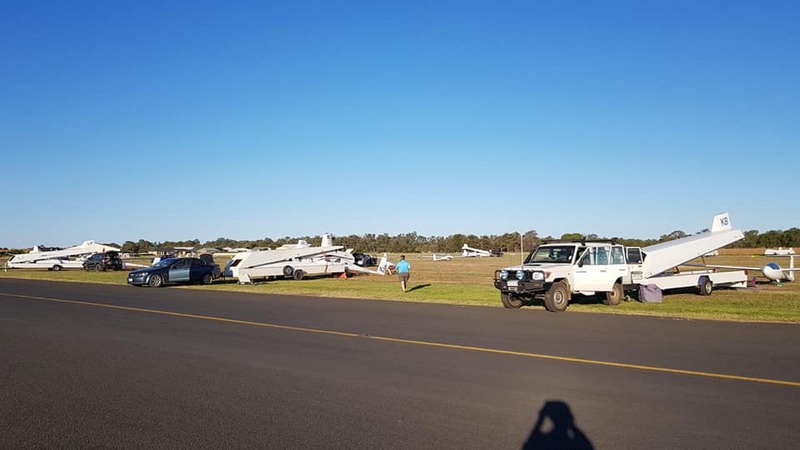 Long ago about 28 years I guess ,there was a group of “daring” Aussie pilots trying to fly from South[ Adelaide] to North [Darwin] over a” lot of nothing!!”. Of course they needed a tug and tuggie and crews. NO SELF LAUNCHERS at that stage. One of the pilots was Giles [Michael] a friend of ours. He had an all female crew, not weird knowing him and he wanted to add our then young daughter Inge to his team. Of course we were a bit reluctant, but we knew Inge and we knew a few other friends ,who would keep an eye on her. 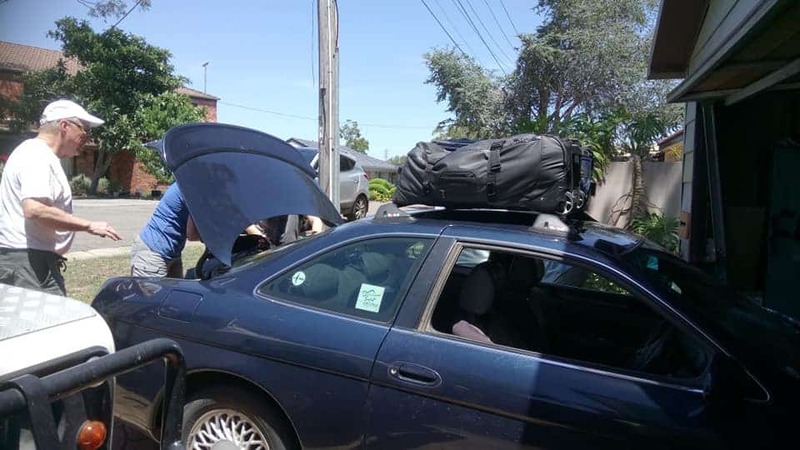 It was one of those unforgettable trips with camel’s and parachute jumping, BBQ’s and visiting places ,we only heard off. She loved it!!!! The way back was easy Inge. After all the trips in the car she was allowed in the back seat with Arny in the Cessna. There you go,…. fun for Inge in the far past and now a good retrieve for dad George.Still the same “good old” Cessna. 2.30 AAT for the small ships and there is no measure on Adam, he won for the 5th time;297 km. in time 2.34!! !Allan was runner up with Andrew [Maddocks] as number 3. Of course Adam is leading at this stage in 15 m. with 300 points on Tobias and 590 on Andrew. In standard Andrew leads ,with with Allan and Peter [Trotter]also still in the race. 3 hour AAT for the big ships and I heard it was pretty clear that an early start was the way to go. Indeed the early starters did better than the late ones. Dave [Shorter ]started straight at 14.06 in his JS 1 and was a new face on the podium; 363 km. in 3.01 ,speed 120 km./h.Norm [Bloch] in his JS 3 was runner up and George, who out landed the day before was 3d in the Discus. Later starters as Lumpy at 14.49 lost a few points. Tom and Butch are leading now with Geoff Brown in the JS 1C on 3 , with just 40 points more than Lumpy on 4. December 5,day 8 ,task 6; TODAY; VERY FAST DAY!!!!! A REAL NARROMINE-DAY!!! 15 m./St.class; Set task from 339 km. and NO not Adam today, as Tobias in his Ventus 2A was faster; 143.20 km./h. He shared the 866 points with Scott Lennon from Temora, who flew 140 km./h but on handicap his LS 8 was equal in points. All 17 pilots flew over 100 km./h. Scott was the winner from St. class. 18m./open; set task from 384 km. and another new face at the podium, though results are very preliminary. 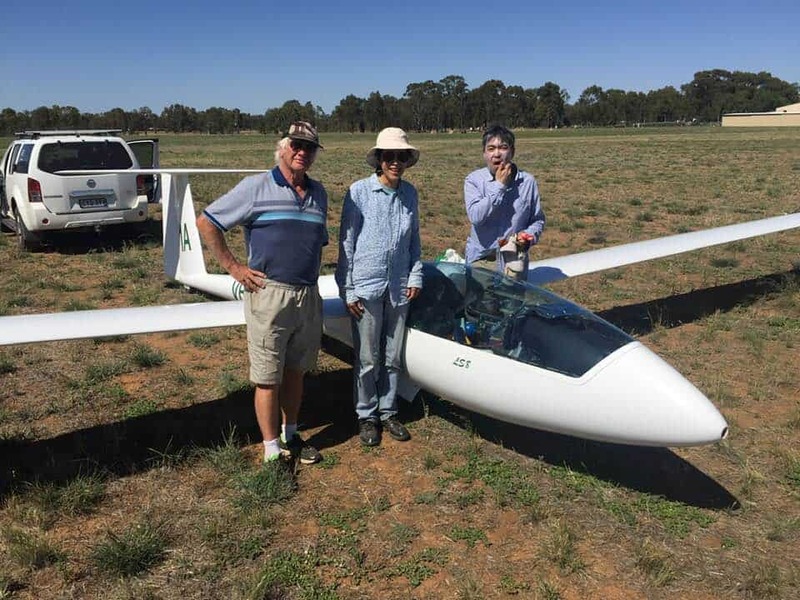 Norm[Bloch] flying comps already as long as I was in Oz, won the day with a speed of 158,96 km./h!!!! Pretty fast!!!! Tom had 155 km./h and Brad 150 km./h. All 25 pilots flew between 114 km./h and the 158.96 km./h. Still 2 day’s to go. More in my next blog. 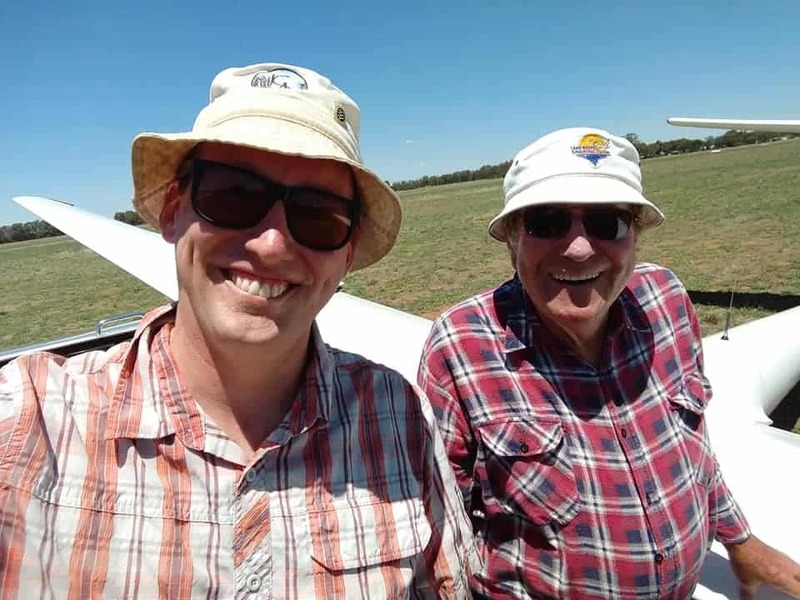 Long time friend and to me, well- known- kilometer -eater Stefan [Soll] added another great flight to his long list of flights from Tocumwal on November 29 in his LS 4 KYO ; 767 km. and nearly 750 triangle; 732!!! On the last day of November good old Chris Davison flew a 838 km. flight in his 21 m. JS 1CTJ from Toc. .
Not only Tocumwal had a great day after all the rain. About 70 km. 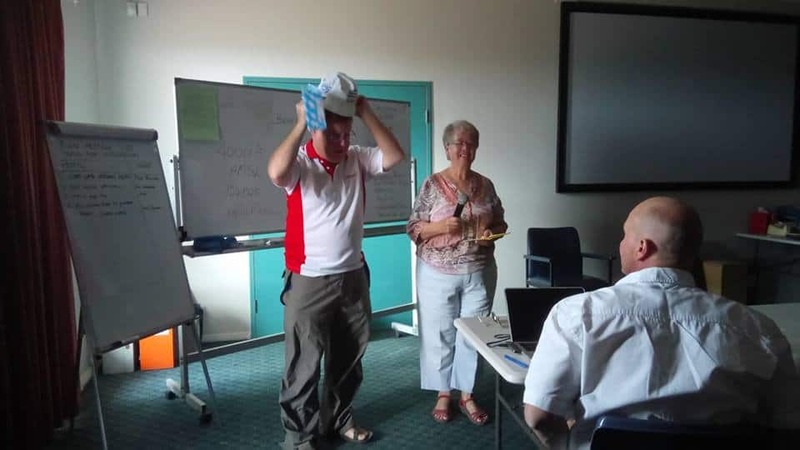 more to the EAST, Corowa had an excellent day as well with a 1000 km. flight for Danish pilots Stener [Leander Nielsen] and Hans Christian [Hoeck]; 1.007 km in the ASG 32 MI. Well done guy’s! !One day later they flew a declared 750!!! The first 1000 km. for Corowa and it might well be the first 1000 in Australia for the season. 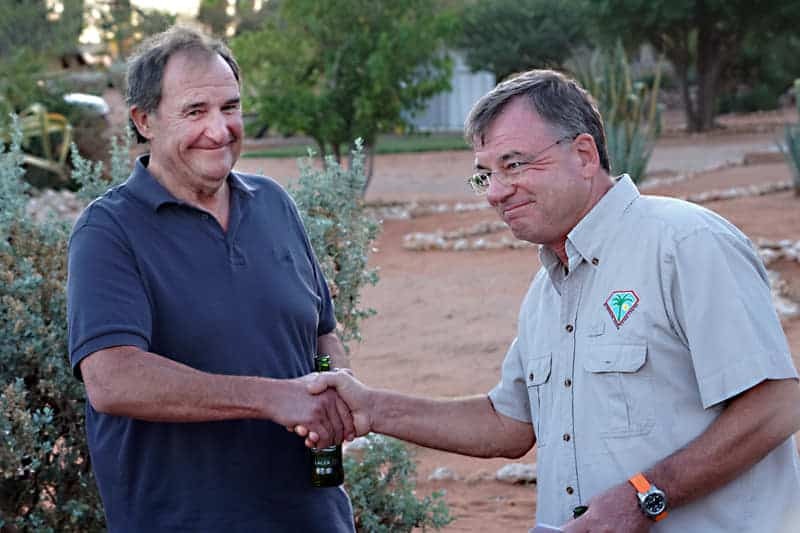 On that great day ,997 for German guest Hans-Juergen [Lange] and 939 for Austrian guest Hans Peter [Ueblacker]as well. ——Worcester [ South Africa] was the place to be last Wednesday; 3 x a 1000 k. one even 1.128 km. On November 17 there were 3 over 1000 km.flights as well. 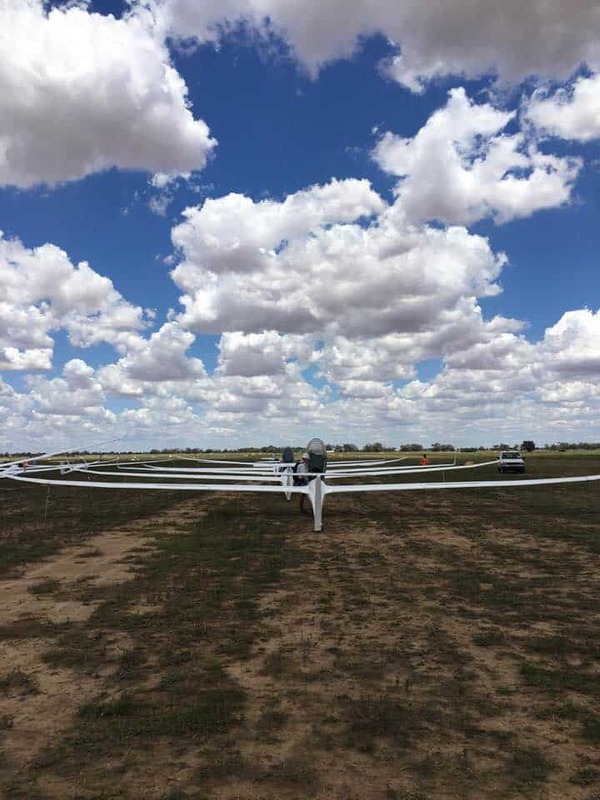 —–Pokweni; December 1….2 EB 29’s from Josef [Eder ] and Alexander [Mueller] flew just over 1.200 km. on a day they did not had to avoid showers.speed 135/137 km.h. —–Bitterwasser on December 4…OLC Speed League cut by Andreas Hillebrand and Jens Böske from 201.16 km/h over 150 minutes in an ASG32 MI. 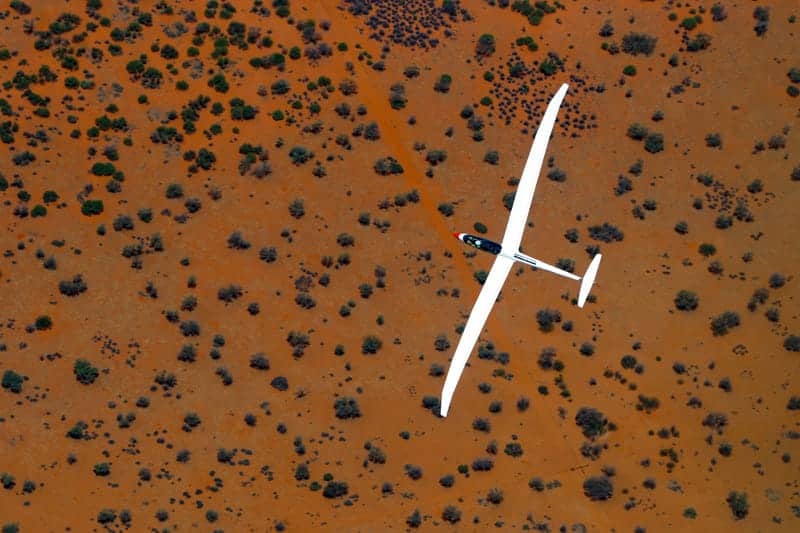 ABOUT GLIDING is a blog that wants to push the knowledge and innovation of gliding forward. “A wide range of themes is in focus: Technological innovation, analyzing extraordinary performances, state of the art practical strategies to fly faster and further, improvements to gliding mathematics and theory, rectifying common misconceptions, proposing and monitoring competition rule changes, searching for record-breaking opportunities, and discovering unexplored territories on earth and beyond. Safety & Accident prevention will be major and recurring topics. 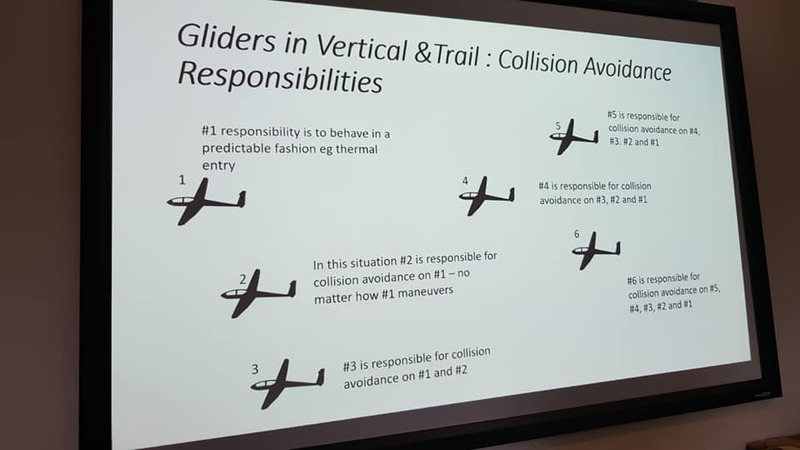 Upcoming articles vary from Cheating in gliding competitions, over Hybrid-electrical tow planes, AI Glider Pilots, an Error in MacCready theory, Analysis of an IFR glider flight, the Potential of Crateus, to Promising methods in reducing gaggles and leaching. A great initiative and behind those very good stories is the well known Belgium pilot Tijl Schmelzer. CU next week with news about the 65 th Argentinian Nationals from San Francisco, flown between 3 December 2018 – 14 December 2018.